Wednesday August 21st 1901 We had ironing and baking to do today. Will and Dell were working at fixing pasture fence. I put in most of the afternoon talking with a carpenter. I took time to drive down with Fannies butter this morning. Thursday August 22nd 1901 We dried corn today and that kept us all the time busy with the work till three oclock. I went down home for a pan but found the folks all gone to the old settlers picnic. I drove down to Elliotts and past of the Wescotts to find the stock had no water, some of them got out today. The boys finished the fence at the pasture today. 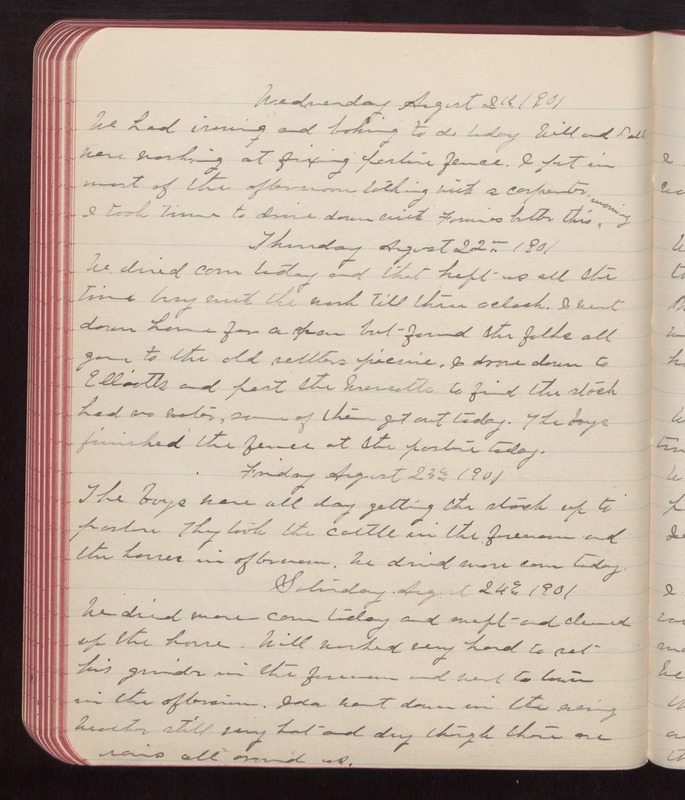 Friday August 23rd 1901 The boys were all day getting the stock up to pasture They took the cattle in the forenoon and the horses in afternoon. We dried more corn today. Saturday August 24th 1901 We dried more corn today and swept and cleaned up the house. Will worked very hard to set his grinder in the forenoon and went to town in the afternoon. Ida went down in the evening Weather still very hot and dry though there are rains all around us.